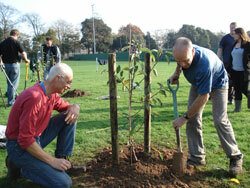 Brighton Permaculture Trust supported Chichester District Council’s Parks and Open Spaces team along with Transition Chichester in the planting of yet another community orchard recently. 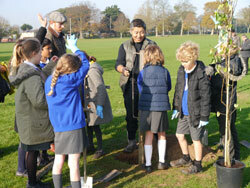 Local schoolchildren and rotary club members also lended a hand to plant apple, pear and plum trees, along with a wildlife hedge. Brighton Permaculture Trust is involved in a number of initiatives to encourage growing, harvesting and eating of local fruit, including planting school and community orchards and hosting an annual Apple Day celebration.